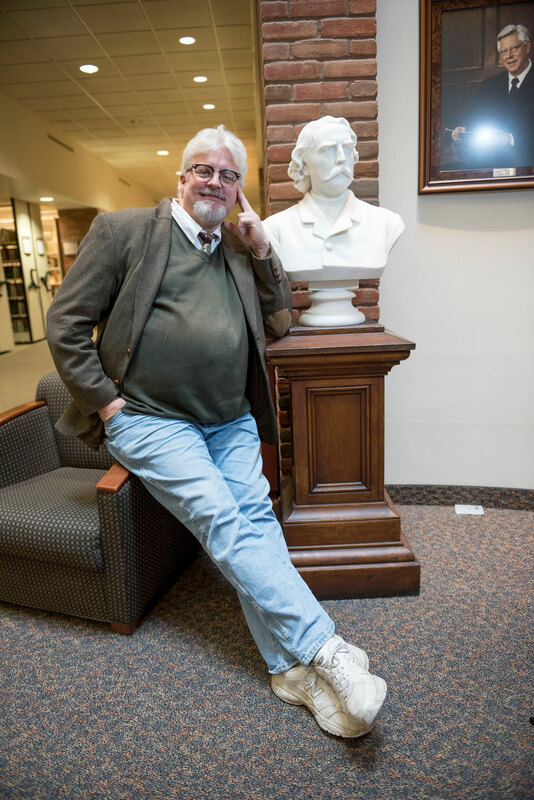 If you crossed paths on the Augsburg campus with history professor Phil Adamo, you would quickly learn of his enthusiasm for the history of the place. You may even hear him share one of the many stories that make Augsburg’s 150-year history so intriguing. Phil Adamo came to Augsburg in 2001, after completing his PhD in medieval history at The Ohio State University. In 2015, he was named “Minnesota Professor of the Year” for 2015 by the Carnegie Foundation for the Advancement of Teaching and the Council for Advancement and Support of Education, the same year he began as Director of Augsburg’s nationally recognized Honors Program. 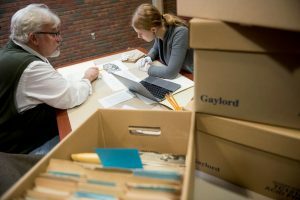 Since 2013, he’s been working with students on a history of Augsburg for its sesquicentennial celebration in 2019. Adamo worked in the College archives with students, including Caitlin Crowley ’16, as part of a class documenting the history of Augsburg. Photo by Stephen Geffre. “Most people don’t know I’m a bit of an art collector. I go to all the student shows and have purchased student self-portraits and other contemporary art. I’m a fan of art and want to support artists. When I found out about the Art and Identity initiative, I started looking at the portfolio of stories about the artists. In fact, I watched every video story on the various artists.